Hi, I am looking to replace and renew most of the running gear on my 1985 b2 Coupe quattro over the coming months. \r\nFrom looking at part numbers it seems the Front and Rear Wishbones are the same? Can anyone confirm this? \r\nNow febi only list 2 different Ball Joints in their parts catalogue, so are the ball joints for front and rear the same? Should I order 2 x FEBI 01521 & 2 x FEBI 01522? Wishbones for front and rear are the same for a 1985 car. \nThe balljoint mounts on the bottom of the strutt assembly and bolts into the adjustable bit on the wishbone, the wishbone bit looks like a front balljoint without a ball joint socket on the end just a tapered hole. 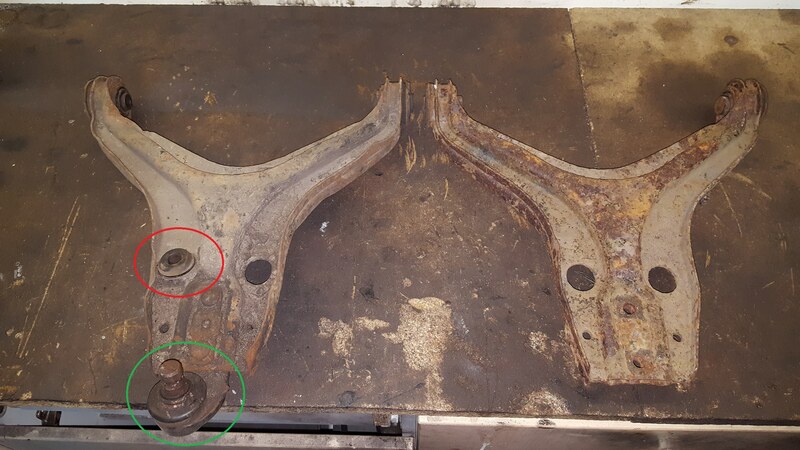 As far as I am aware the front wishbones fit the rear physical dimensions but the correct rear wishbones do not have an anti roll bar mount union fitted to them, they can be fitted upside down, look at the pressings in the wishbone for correct way up, been down the garage and found front and rear wishbones, photo below of near side wishbones front and rear, front wishbone has red circle with anti roll bar bush, green circle has bottom ball joint in it bending forward, notice rear wishbone, no welded in union for anti roll bar bush. 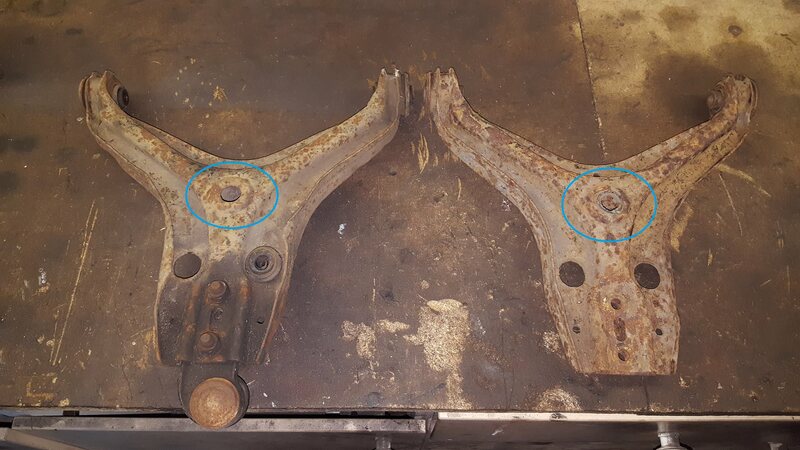 \r\nPhoto below of under side of both wishbones, notice the pressing in the blue circle, I think this to let water drain out. sorry don\'t have a bottom ball joint link arm for rear wishbone but had a look below Ur quattro and it bends to the rear, more advice as if you need it, take photos of every thing as you dissemble it, yes it is a pain to do but if you take photos reassembling you will have before and after photos to post on the forum. Thank you Dave and Colin for taking the time to reply, I nearly ordered the wrong ball joints. This forum is great! Does anyone know if these rear ball joint carriers are available as new replacements? \r\nOr Should I clean up my current ones? Thanks Colin, as you can see from the pic, it\'s all pretty rusted and in need of attention under the car. I\'m planning to have all the struts, subframes and anti roll bar blasted and then powder coated so this is something else that will be added to the list. \r\nAnything that can be replaced easily (and fairly cheaply) will be getting replaced with new parts. I\'m collecting all the parts together first then once I can get it on the ramp it will all come apart and then be re-assembled. \r\nHoping to do hubs, discs and brakes at the same time, just on the hunt for some 5 stud UR hubs. \r\nThanks for the tip on the copper grease, just ordered some on ebay. Agree with Colin on this one, its a non wearing part and NLA and although it may look very rusty it should clean up amost like new, availability was bad 25 years ago when I did my UR suspension I remember the Audi oe rear ball joints being in the region of £100 and no one made pattern ones back then.